MBI's mission is to be the essential resource for improving member performance and promoting a business environment favorable to the construction industry. Master Builders of Iowa is the recognized leader of the construction industry in the state of Iowa. Founded in 1912, MBI is one of 89 chapters of the Associated General Contractors of America, the most influential and widely respected construction association in the country. MBI’s members perform the majority of the state’s commercial, industrial, and public works building projects. The association provides its members with a comprehensive array of educational, safety, environmental, labor, legal, professional development, and legislative services. Earn an Award for Learning - It's a Win-Win Situation! What the heck is GOTV? How can I help celebrate my company, the people in it, and our industry as a whole? Great Times at the 6th Annual MBI-PAC Sporting Clay Builders’ Classic Events! The MBI Smoker – One of a Kind! Construction Week ’18: A time to promote the industry and recognize outstanding employees! Commercial Construction’s Next BIG Thing – BIM! MBI Build Iowa Career Fair Announcement! Companies that are considered MBI’s Essential Partners have contributed over $3,000 in sponsorships to Master Builders of Iowa in the past year. These companies are an important part of our success and we couldn’t do it without them! How can the latest software technology positively impact your business? In this webinar, we’ll look at the ways cloud software can improve your workflow, freeing up your time so you can do more of what you do best: build. Unit 1: Variation in Production Systems. This half-day course introduces one of the foundational concepts of Lean Construction, variation. Unit 2: Pull In Production. This half-day course that explains the concept of pull as a means to reliable production workflow. Unit 3: Lean Workstructuring. This unit is the first of two that introduces the Last Planner® System (LPS). This system was developed by the Lean Construction Institute (LCI) to plan projects in a way that produces predictable workflow and rapid learning. 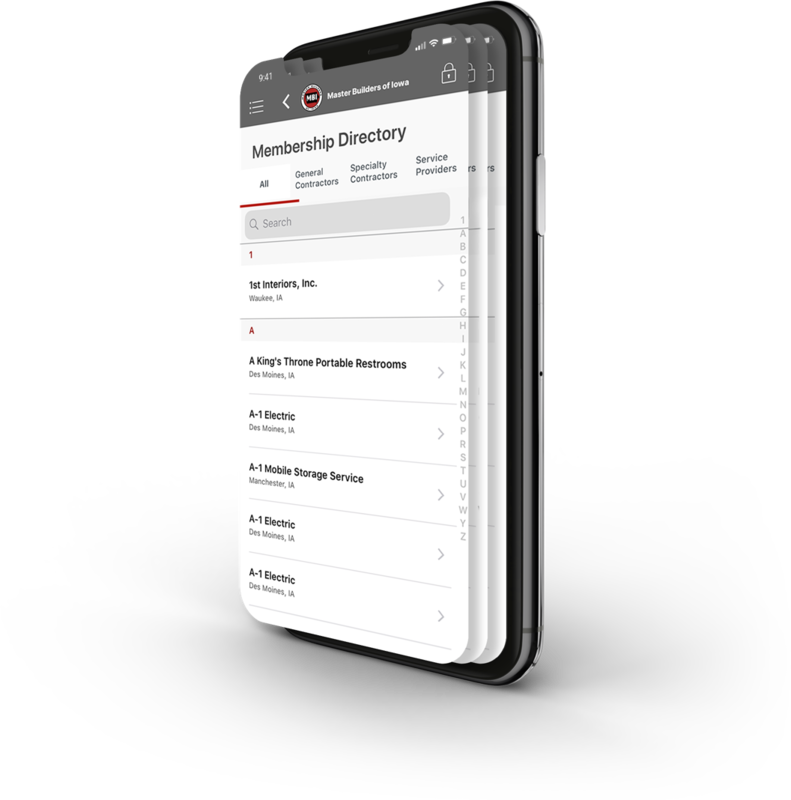 Our mobile app can help simplify your life by providing you with all of our information in a format that maximizes usability on the go. This re-launched offering features all the basics currently available on the website, while also incorporating access to MBI’s Training Vault. MB EYE ON THE FUTURE - NOMINATIONS OPEN! This program offers attendees a tremendous opportunity to continue their path of success and become more involved as current and future leaders of the construction industry in Iowa. It introduces participants to MBI, while focusing on communication and stepping outside of your comfort zone. Nominations for the 2019-2020 class will be accepted until May 24th.